If you're the gnarliest surfer on the beach but prefer to catch your waves at the crack of dawn, odds are there won't be anyone around to witness or film your exploits. So for extreme athletes lacking friends who wake up before noon, the Soloshot mount lets you capture all your fancy moves without a cameraman. 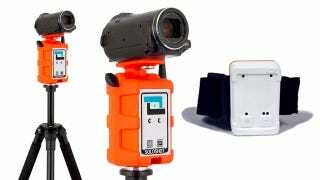 It sits between a tripod and a camera—connecting to each using their standard mounting screws—and automatically pans and tracks whoever is wearing an included waterproof armband. Since it's all wireless the rig is free to rotate 360 degrees, and its maximum pan speed is over 40 degrees per second. So it should even be able to track a fast-moving vehicle as it whizzes by. And with a range of 2,000 feet, you'll be out of your camera's visible range before the mount loses track of you. Update: Even though the Soloshot website includes an online store for ordering the mount—and seems to indicate it's an available shipping product—it's been brought to our attention that this is unfortunately actually a Kickstarter project that's still trying to raise funds. We apologize for the mistake, and our decision to not cover Kickstarter projects still stands.